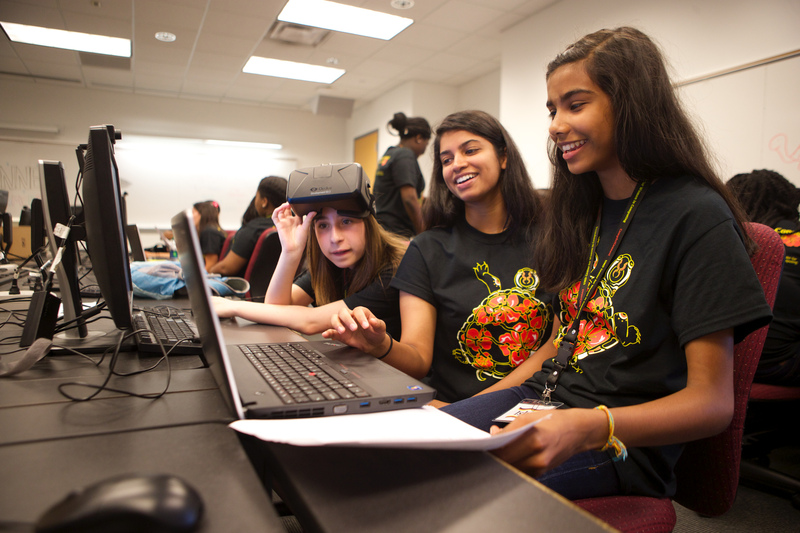 Inside the University of Maryland’s Virtual and Augmented Reality Laboratory earlier this month, 15 middle-school girls showed off the virtual reality games they created during this summer’s Computer Science Connect (CompSciConnect) program. Zoe Smith, Sayeemah Ahmed and Erica Lopez-Haz created a game for the Oculus Rift virtual reality headset where players shoot oncoming asteroids to earn points. CompSciConnect is a two-week summer day camp that offers middle school girls the chance to explore activities in computing, including Web development, computer programming, robotics and cryptology. They also take field trips to places where they can see the applications in computing, such as the Newseum and research institutions. Designed as a three-year program, each cohort returns the following summer to learn more advanced skills and meets once a month during the school year to maintain their skills. This year’s three cohorts total 82 students. 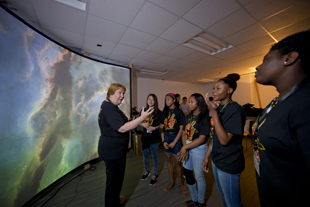 CompSciConnect also provides an opportunity for female undergraduate students in computing-related majors to teach younger students about computing, while sharing their own excitement about and interest in the field. Founded by Jandelyn Plane, a senior lecturer in computer science at UMD and director of the Maryland Center for Women in Computing, CompSciConnect is entering its fourth year. The “connect” in the program’s name has a two-fold purpose, according to Plane. The first goal is to show the students how computing connects to everything in the world. The second goal is to connect the girls to one another, with the goal of them forming long-term relationships. Back in the Virtual and Augmented Reality Laboratory—also called the “Augmentarium”—Isha Santhosh and Kayla Newby demonstrated their virtual reality game, a driving simulator where players earn points by collecting cubes floating throughout the environment. One of the most interesting parts of the project was designing the environment, said Santhosh and Newby, which they created from scratch. Santhosh will be an eighth-grader this fall at Murray Hill Middle School in Laurel, Md., and Newby will enter ninth grade this fall at Northwood High School in Rockville, Md. Newby, who joined the program last year after hearing about it at some workshops, said it has been incredibly fun to learn a bunch of new things, like developing a game using Unity 3D this year and creating a website during her first year in the program. In addition to showcasing their games, the students learned about virtual and augmented reality technologies and applications UMD researchers are working on from Amitabh Varshney, a professor of computer science at UMD, director of the University of Maryland Institute for Advanced Computer Studies, and director of the Virtual and Augmented Reality Laboratory. 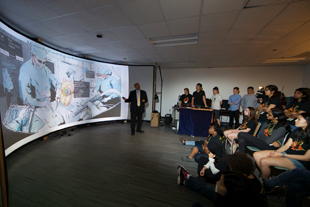 Varshney also described to the students ways that virtual and augmented reality could change the world in the future. Initial funding for the UMD Augmentarium came in part from the National Science Foundation (NSF) through a $600,000 Major Research Instrumentation grant used to purchase equipment and develop outreach programs. “We believe that virtual and augmented reality will play a large role in making STEM education more accessible—and more fun—for a wide group of students. Completely new pathways of discovery, both for science and education, will come from these innovative technologies,” said Rita Rodriguez, the NSF program director who manages the UMD Augmentarium award. The CompSciConnect program has been supported by the Armed Forces Communications and Electronics Association (AFCEA) Bethesda Chapter since its inception. A donation from Brendan Iribe, UMD alumnus and founder and CEO of Oculus VR, allowed the camp to grow this year.